In the central Philippines, indigenous groups make up about 10 per cent of the population. In recent decades, their unique way of life has been largely eroded by western influences, their native lands increasingly appropriated by powerful, more formally educated people. But one tribal group is marking 25 years of educating youth in a system that values and preserves their culture. Madonna Virola reports from Mindoro Island. 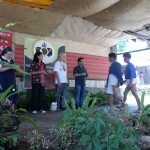 An animal horn signals the start of the graduation ceremony at the Tugdaan Mangyan Center for Education and Development. Popularly called Tugdaan, the school sits on five acres of land donated by the community and located at the foot of Mount Halcon. Tugdaan means seedbed. 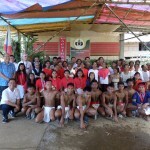 The school focuses on the realities, needs and aspirations of the sub tribes on Mindoro Island, like the Mangyan. “We’re happy here, all from the same tribe. Unlike in other schools, here, we are treated equally,” says Vilma Talibukas, one of the poor Mangyan students who graduated from Tugdaan High School early this month. “Our teachers are like our friends. Life is simple. We can wear our native attire and speak our language.” Vilma feels at home here where almost all administrators, teachers and staff are Mangyans. Classes take place in open-air rooms built in a cool, naturally landscaped garden on the mountain-side with the blue sky for a roof. There’s an organic herb and vegetable garden here, as well as animals like chickens, pigs and goats. 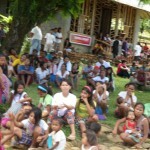 Abadiano came to the region as a volunteer from southern Philippines. In 2004, he received Asia’s Ramon Magsaysay Award for Emergent Leadership. He says Tugdaan started as a informal form of education that teaches literacy, leadership, community development, and a culture of peace and land rights. After 25 years Tugdaan has grown, and now serves about about one hundred-sixty students and includes an early childhood development program called Bisloyte. The state-run Department of Education has recognized the four-year secondary school for its indigenous curriculum, including story telling, poetry and handicrafts. The tribe’s unique traditions are kept alive at the school’s Mangyan Living Heritage Center. And parents find work and students are trained by the Tugdaan food processing center, where fruit and flower juices, jams, herbs, chocolate and coffee are packaged and exported. The proceeds fund the school. Tugdaan also hosts dialogues and national trainings designed to further peace. Life skills are taught at the school, and parents have become trainers. At the graduation program, many who have helped Tugdaan expand and grow were recognized, including parents, alumni, school administrators and volunteers. Members of the Mangyan community are now working on a campaign to raise 25,000 tree seedlings to send to the survivors of super typhoon Haiyan in Tacloban City.